Here’s some of the early questions asked about Plugless for the BMW i3. What is Plugless for the BMW i3? The BMWi3 is a remarkable statement in the future of mobility – superior design, innovation, and performance. 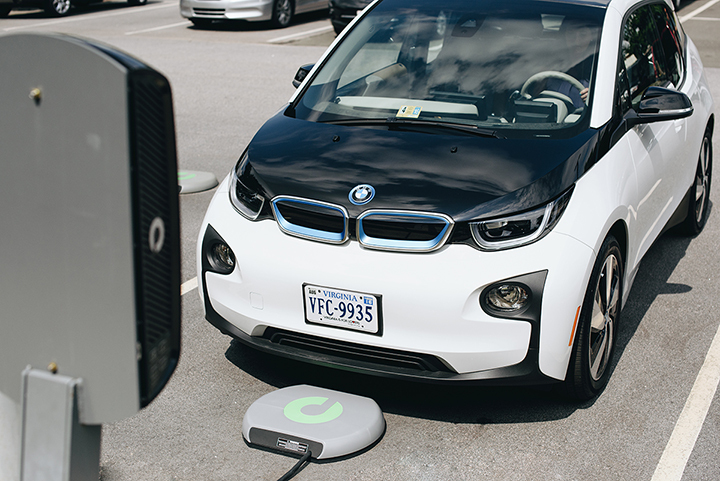 Plugless is the premium wireless EV charging system for i3 owners. It’s the future of EV charging. Plugless for the BMW i3 is built on our second generation platform, offering 7.2kW of power per hour passed over the air itself – using high-efficiency inductive power transfer technology. That’s ~20-25 miles of range charged per hour, wire-free. Wires tie you down. Take your i3 off the leash. How can I be sure Plugless will work for me? First, see for yourself. Here’s a video of the 7.2kW Plugless system charging a BMW i3. You can see the Parking Pad under the car and the car charging at a rate of 24 miles of range per hour. Plugless has already logged more than 850,000 charging hours with customers at homes across the USA. The number one comment from Plugless owners is that there is simply no comparison to the experience of driving a self-charging car. Did you work with BMW on this technology? Plugless is developed by Evatran, the world-leader in high power inductive charging products. Plugless is an independently developed accessory. We can confidently tell you that Plugless integration is seamless with the i3. Will Plugless affect my vehicle warranty? No, adding Plugless as an accessory doesn’t impact your BMW i3 warranty. For more than 2 years and 850,000 hours charged with Plugless, there has not been a single incident where installation of Plugless has affected the vehicle warranty. Additionally, our warranty specifically protects you against any event where the installation or presence of Plugless causes the automaker to void any part of your warranty. Where will Plugless be installed? Installations will be performed by a certified Plugless BMW installer. Installation takes ~2 hours, and our Customer Care team coordinates the installation to take care of you from start to finish. Expect a great customer experience. How much does Plugless for BMW i3 system cost? While our other second generation Plugless system for the Tesla Model S starts at USD 4120, because the BMW i3 is engineered in a way that makes the addition of wireless charging even more straightforward, the price of Plugless for the BMW i3 total system cost is USD 3499, which includes the cost of installing the vehicle adapter at a certified dealer / installer. Shipments for Plugless are expected to begin June 2017 with priority given to reservation holders in the general order received. Yes, absolutely. At any time… for any rhyme or reason… you can cancel your reservation and your money will be fully refunded. What is the power level for this charger (how fast does it charge)? Plugless for the BMW i3 is a 7.2kW charger, and charges 20-25 miles of charge per hour. Plugless will recharge a fully drained i3 in as little as 4.5 hours. Plugless for the BMW i3 requires a 208/240 volt, 50 Amp, 2-pole, dedicated circuit rated for “continuous duty”. Plugless can be installed using a NEMA 14-50 outlet or it can be directly wired (“hardwired”) by your electrician. If you have questions about the installation, call or email. We’re happy to help. More details on electrical requirements here. What is the vehicle adapter and where is it installed? The Plugless vehicle adapter is the slim receiving coil for the inductive power transfer, which is installed just behind the front axle in an open area incorporated into the i3 design by BMW. Installation of the vehicle adapter is fully reversible to factory condition and does not impact any leasing agreement. Installation of the vehicle adapter changes nothing about the aesthetics, clearance or maneuverability of your BMW i3. It is not the lowest part on the vehicle and does not reduce ground clearance or entry and exit angles. Plugless is a seamless integration with the i3. Plugless can be installed indoors and outdoors. It is engineered to perform over a wide range of temperatures and conditions from the most arid heat, driving rain, wind, and packed snow. In fact, the worse the weather conditions, the more you’ll love how your Plugless and your i3 work together to take care of the charging for you. Does Plugless work with the BMW i3’s onboard timing system? Plugless works with your BMW charge timer. We love the i3, and we design our product for ultimate simplicity and usability. Plugless changes nothing about how you interact with your i3, except letting it charge itself for you.